Federation Avenue was established by the citizens of Bacchus Marsh and Rotary to celebrate the centenary of Federation. To celebrate the Centenary of Federation the Rotary Club of Bacchus Marsh applied for and received a grant to plant trees along Gisborne Road, to be known as Federation Avenue. Red flowering gums, native to Western Australia, were chosen, and to accelerate their growth, they were grafted onto red spotted gums. In conjunction with the Work for the Dole Scheme, former Rotarian Byron Guthrie arranged and assisted in the preparation of the planting beds. Frank Ruffo formed the mounds and provided valuable assistance in preparing the various garden beds that were an adjunct to the avenue of trees. Over 500 people attended the dedication of the Avenue, including local member Joanne Duncan MP. On a prearranged signal, namely the sounding of a siren on a local CFA truck, citizen of Bacchus Marsh planted 162 red flowering gums. The Rotary Club of Bacchus Marsh has continued to maintain the Avenue, and has replaced many trees destroyed by vandalism, and the drought. The Federation of Australia was the process by which the six separate British self-governing colonies of Queensland, New South Wales, Victoria, Tasmania, South Australia, and Western Australia formed one nation. They kept the systems of government that they had developed as separate colonies but also would have a federal government that was responsible for matters concerning the whole nation. When the Constitution of Australia came into force, on 1 January 1901, the colonies collectively became states of the Commonwealth of Australia. 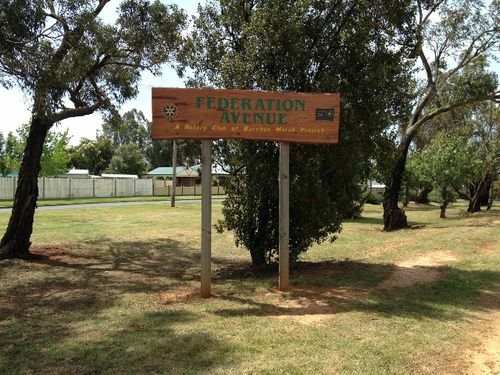 The Federation Avenue and Gardens were established on Saturday 5th May , 2001 by the citizens of Bacchus Marsh to celebrate the centenary of Federation. We place our faith and trust in future generations to cherish and protect these gardens as a memorial to our heritage and its uniquely Australian environment.